There were 1,750 hopeful players who entered but only one man survived Event #63: $1,000 No-Limit Hold'em. Rulah Divine won his first bracelet and $262,501 — by far his largest cash. Not too bad for a $60 investment; Divine won the seat in a WSOP.com qualifier. The day began with 20 players returning during Level 21 to play down to a winner. With the elimination of Andy Frankenberger in 10th Place ($16,074) players were at the final table in level 24. Jeffery Silverstein was sent home in ninth place ($20,640) after his couldn’t hold to Fabio Felice Cudia’s . Action was slow with small pots being picked up here and there and hardly any flops seen. Eddy Sabat shoved his last chips with and ran into of Patrick Truong. Sabat went home in eighth place ($26,806). John Monnette was all in for his life shortly after Sabat's elimination but managed to double when his beat the of Cudia. Cudia was down to one blind and eliminated the next hand in seventh place ($35,207). Only four hands after the massive double up, Monnette was eliminated in sixth place ($46,758). He lost most of his stack with kings to Michael Amato with ace-queen when Amato hit his ace on the turn. Five-handed, the players took an hour dinner break and returned to move to the Amazon Room. Ryan Hughes was the first player sent home from the new final table in fifth place ($62,785). Divine got a rush of chips at the final table when he eliminated Yunsheng Sun with ace-five against Sun’s ace-queen The flop came and Divine paired his five. The turn was the and paired the queen for Sun, and the river was the to give Divine the flush eliminating Sun in 4th place ($85,226). The third place finisher Michael Amato ($116,940) got his chips in over a raise from Patrick Truong but was called by Divine and Truong folded. Amato held and Divine held . The ace on the river sealed it for Divine and propelled him as a chip leader into heads up play. Truong announced to the table he folded and would’ve ended the tournament right there. 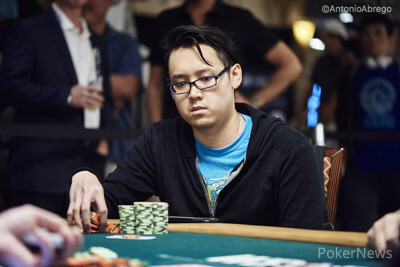 Heads up lasted 23 hands and Truong was eliminated when his two pair couldn’t beat the higher two pair of Divine. Truong went home with ($162,170). This won’t be the last we see of Rulah Divine. He explained he will be playing the Main Event now as he was unsure before, but this win helps his bankroll and his motivation. Divine's first call was to his wife whom he said was "freaking out" on the other end of the line. He explained this win solidifies everything he has been playing for since he was six years old playing poker for nickels and dimes on his dad's bar. Rulah Divine completed and Patrick Truong checked. The flop came and Truong bet 100,000. Divine called. The turn was the and Divine checked. Truong bet 250,000 and Divine moved all in. Truong called. The river was the and that was it for Patrick Truong who finished in 2nd place. Hand #182: Rulah Divine raised and won the pot pre flop. Hand #183: Patrick Truong completed and Rulah Divine checked. The flop came and Divine check-folded to a bet from Truong. Hand #174: Rulah Divine opened and won the pot. Hand #175: A limped pot to a flop of where Patrick Truong bet 100,000 and folded to a raise from Divine. Hand #176: Another limp, this time from Devine and to the turn of a board where Devine won it with a bet. Hand #177: Limp from Truong and they saw a flop of . Divine check-called a bet of 100,000 and they saw the turn card where Divine once again called a bet of 300,000. On the river Devine folded to a shove from Truong. Hand #178: Truong got a walk. Hand #179: Another limp from Truong and the flop was . A bet of 150,000 from Devine won the pot. Hand #180: Divine opened for 250,000 and took the pot. Hand #181: Truong limped and the flop was . 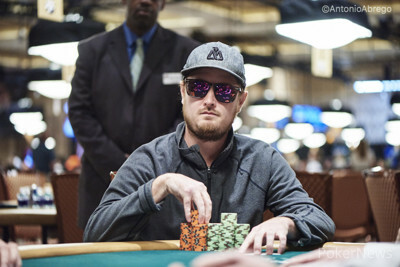 Devine called a 100,000 bet but folded on the turn to a 160,000 bet from Truong. Hand #168: Rulah Divine raised and took the pot. Hand #169: Patrick Truong completed, and Divine checked. The flop came , and Divine check-folded to a bet from Truong. Hand #170: Divine raised and took the pot preflop. Hand #171: Truong completed, and Divine checked. Hand #172: Divine moved all in, and Truong folded. Hand #173: Truong completed, and Divine checked. The flop came , and Divine check-called a bet off 100,000 from Truong. The turn was the , and again, Divine check-called a bet of 140,000 from Truong. The river was the , and Divine checked. Truong bet 370,000, and Divine folded. Hand #163: Patrick Truong got a walk. Hand #164: Truong made it 190,000 and folded to a shove from Rulah Divine. Hand #165: Divine made it 175,000, and Truong called. 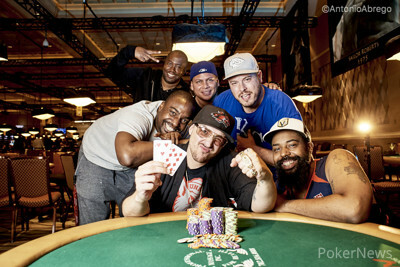 The flop was , and a continuation bet from Devine won the pot. Hand #166: Truong bet 190,000, and Devine called. The flop was , and Devine bet 250,000. Truong called. The turn was the , which was checked around, and the completed the board. Devine bet 375,000 and took the pot. Hand #167: Devine opened for 175,000, and Truong called. They got to the turn of the board reading , where Truong bet 200,000 and Devine raised to 475,000. Truong called. The river was the , and a check from Truong saw Devine move all in. Truong folded. Hand #168: Truong opened for 190,000 and folded to a shove from Devine. Hand #161: Patrick Truong raised to 160,000 under the gun, and Michael Amato moved all in for over two million from the small blind. Rulah Divine called in the big blind, and Truong folded. The board ran out , and the ace on the river eliminated Amato. Truong claimed to have folded , which would've ended the tournament had he called.